Happy Tuesday! With Thanksgiving only a few days away, we’re headed into major eating season. While stuffing and sweets will be plentiful over the next couple of months, I wanted to share a delicious and healthy breakfast idea to start the day. 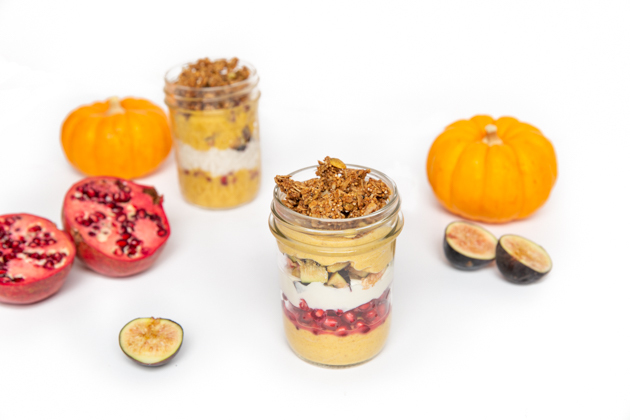 This Pumpkin Pomegranate Parfait is the perfect mix of nutritious and festive. It can also be made gluten and dairy free. I tested the recipe with three types of yogurt (coconut, cashew and Greek) and it came out delicious each time. 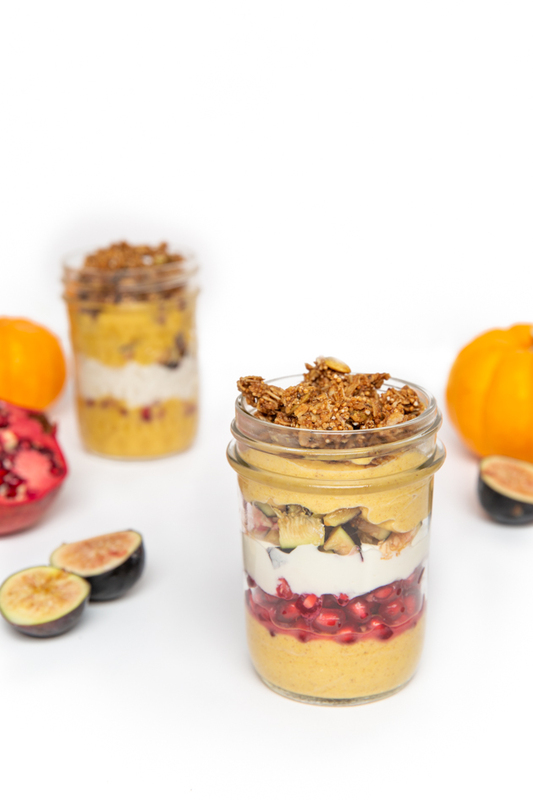 The coconut and Greek yogurt gave the parfait a tangy breakfast flavor and the cashew yogurt was so sweet you can easily call it a Pumpkin Pomegranate Parfait Pie and serve it as a healthy dessert! That being said, I will say that the Greek yogurt mixture is a lot thicker and makes for a prettier parfait. If you look closely at the photo above, you can see the greek yogurt parfait in the front and the cashew yogurt parfait in the foreground. Clearly the Greek is far more photogenic. 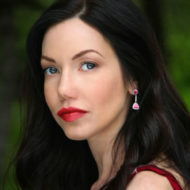 **Use organic ingredients where possible. Place 2 1/2 cups of the yogurt, the pumpkin puree, the pumpkin pie spice and maple syrup in a large mixing bowl. Using a fork gently blend the ingredients to combine thoroughly. Line a small mason jar or clear glass with a layer of the pumpkin and yogurt mixture. 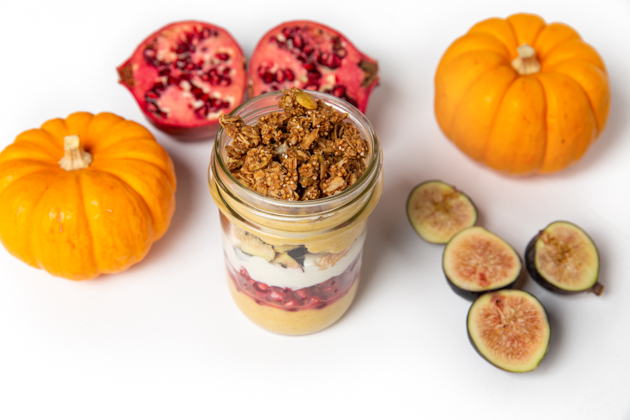 Carefully add a layer of pomegranate seeds, a layer of plain yogurt, a layer of the chopped figs and then another layer of the pumpkin and yogurt blend. 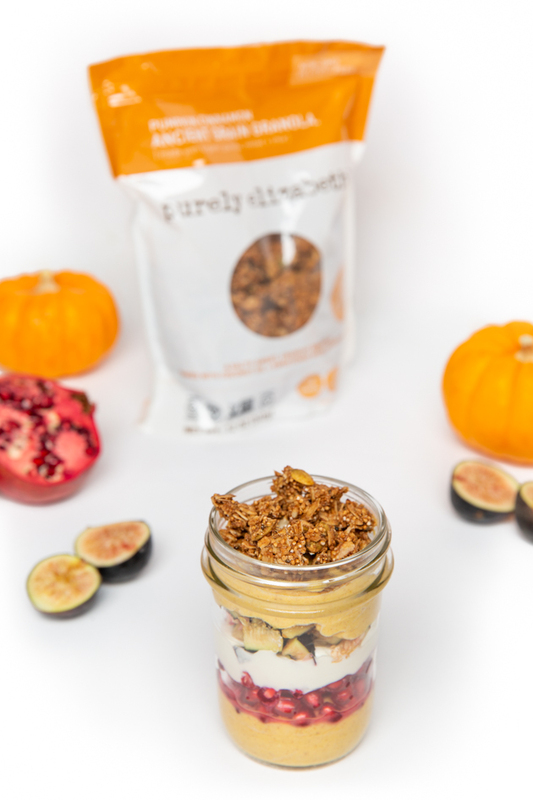 Top with the Pumpkin Granola and serve immediately or cover and place in the refrigerator to serve the next day. Makes 4 Servings. This healthy breakfast recipe will satisfy your taste buds and fill you up just enough to stay on track for healthy eating throughout the day. It’s also a perfect recipe to serve at a Thanksgiving or Christmas brunch. 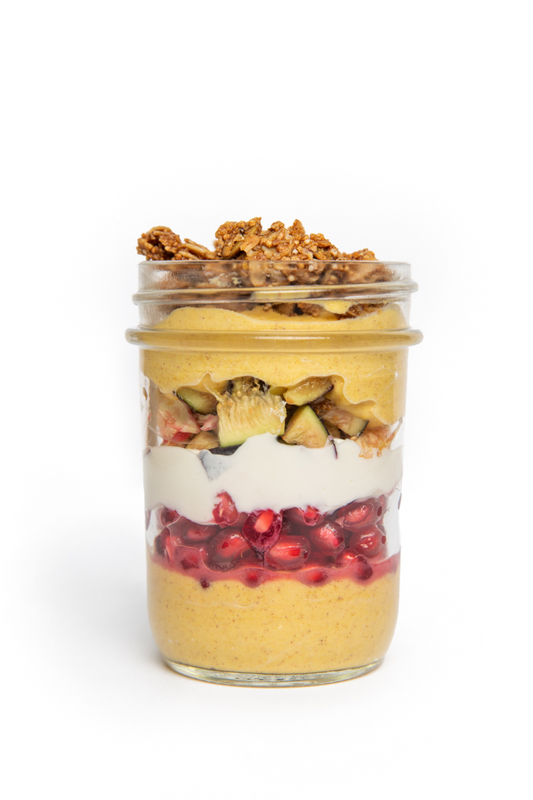 You can prepare the parfaits the night before and add the granola just before you’re ready to serve. Bake a side of these Gluten-free Pumpkin Muffins or Gluten-free Pumpkin Oat Scones for an extra holiday treat. I just love healthy and easy entertaining options, don’t you?